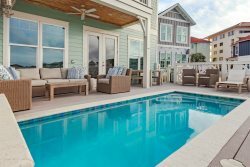 Gulf Front Community, Private Outdoor Grilling Area, Sleeps 20, and Steps from the Beach! LOVED THIS HOUSE! The Moore the Merrier annual family reunions have voted the Beach Reunion homes our number one choice for vacationing! Our concierge was available to us every day (Carrie) in both the Venetian Palace and the Aurora. Carrie is always so accommodating and high spirited and you can tell she is passionate about what she does! Its always a pleasure working with her! This year (June 2017), we celebrated a 70th birthday, "white attire" celebration at the house AND a wedding on the beach. This year we required two houses to accommodate our extended family and friends. The Venetian Palace and the Aurora were right across the street from each other! I found both homes beautifully decorated but I will focus my comments on the Aurora. This 8 bedroom home, sleeps at least 23-25 people, the private swimming pool and Jacuzzi were perfect in the front of the home, providing an awesome alternative to the beach. When it was time to go to the beach, it was a 5 min walk within two blocks from the private beach entrance. The layout of the home accommodated all ages for indoor activities. The ground floor provided access to restroom, a refrigerator and even provided access to a large pool table! The large kitchen on the main floor was able to accommodate seating for a brunch for both houses! The large table, kitchen bar, balcony seating or the living room area was perfect for our meal times. Although you dont was much television on vacation, every room provide a flat screen TV and most rooms had a private bath. I was the party planner for the white party and prior to our arrival Carrie provided a list of recommendations for local vendors, caterers, suppliers planning, logistics, and, she allowed us ship our supplies prior to our arrival! Carrie even provided the proper mailing instructions to ensure she was able to delivery our boxes to either houses. Carrie played a huge role in the success of our special events! Thank you again, Carrie! We will definitely return to Beach Reunion homes and our new guests this year are already planning to join us next year! I highly recommend you call Carrie, at the Beach Reunion homes for THE BEST VACATION EXPERIENCE, EVER! Wedding/4 Generation Vacation 4 generations traveled to Destin for our daughters beach wedding. Locating a house large enough for 6 family units, ranging in age from 4 to 89, close to the beach, in the general vicinity of the wedding was our goal. This house fit our needs perfectly! The beach was beautiful, and closer than I expected (1 minute walk). We loved the second floor porch, and spent many hours out there playing cards. Having a bathroom with almost every bedroom was great. The house was clean upon arrival and the kitchen was equipped generously. We loved the beach umbrella and beach chair service that were included in the price. We would definitely recommend this house, and hope to return to it ourselves some day. Happily Ever After We rented Born to Sun beach house from Beach Reunion for our wedding weekend. We had our rehearsal dinner and reception at the house and our ceremony on the beach. Everything was absolutely perfect! The house was so beautiful and spacious with all of the special amenities such as an elevator for our guests who couldnt climb the stairs. We would definitely recommend renting the Firefighter Margarita Machine and golf cart for your stay. The margaritas and beach drinks were perfect for our guests and the golf cart made trips to the beach much easier especially with all of the children we had. We also used it to transport our guests to the ceremony. Beach Reunion also provided us with our concierge, Carrie. She was amazing!! She is so sweet and helpful and made sure we had everything we needed. There is no doubt we will be back one day! Beautiful Home, Exceptional Staff We rented the Venetian Palace for my wedding party to stay. The house was just as pictured, beautiful, spacious and very clean. The concierge Carrie is the BEST!! She is there every step of the way giving advice, information on local venders, even supplied us a stereo to borrow for our wedding ceremony on the beach. She answers you immediately and is very accommodating. The owner Jim as well is great. He came to the house to make sure everything was going okay, and let us know he is available if we needed anything. We are going to return to Destin every 5 years with our friends at a beach reunion property because they are outstanding. Id never rent a hotel down there ever when you can get a private house for practically the same price. Sibling Reunion A Success My family stayed at the Athena property in Miramar Beach. We cant expect perfection so there were a couple minor issues but whenever anything came up, Beach Reunion responded promptly and handled it well. I will definitely rent with them again. Very satisfied customer One word "Exceptional"
Just Fabulous! We recently stayed at the Solmate in Destin, and it was just fabulous. The house and pool area far surpassed what we had hoped for, and the access to the beach was wonderful. Our every need was met. I would use Beach Reunion in a heartbeat. Wonderful house We stayed in over the top for my wedding and it was the perfect dream house! Everytime we called the front desk they were exceptionally nice and met our every need! Thank you so much for everything! Senior Trip 2017 We had an awesome time at this house. There were 21 in our party. The view from the house is great. I loved the fact that the house is in a gated community. The house is located next to the access to the beach. The parking at the house is limited especially for large SUV, but we were able to park 3 vehicles there. Other reviews had comments about the fridge being small. We had no issues and there is a second fridge in the garage. I loved the fact that the pool is enclosed and secluded. The lounge chairs in the back yard are very nice, especially if you are tired of being on the beach in the sand. Just come back up to the house and lay on the chairs. The only negative things I would say about this property is that there is not enough seating in the living room for a large party. There is a large dining table and a smaller one in the breakfast nook, but it only accommodates 13 people. There is a small table, fridge and microwave in the carriage house though. The mattress for the pull out couch in the carriage house is worn out and if an adult was planning on sleeping on it you would want to get a mattress pad. Loved the location, loved the house and would definitely rent it again. If you are bringing a trailer with luggage,etc it is not allowed in the community. We unloaded ours and went a parked it at the Winn Dixie right up the road. Amazing House! We booked our 9 family (8 out of 9 with kids) trip through Beach Reunion. They were great to work with! Born to Sun is a beautiful home and we never felt overcrowded, even with a full house. The bedrooms are a great size, kitchen is spacious, outdoor pool/area is huge, and its a very easy walk to the beach. Some of the kitchen appliances and a couple of bathrooms were a bit dirty on arrival, but I still give this property 5 stars! This house will not disappoint! Wonderful! Best vacation spot ever! We loved everything about it!!! Perfect location , easier access to the beach than from the beachfront condos we have stayed in! Can not wait to return, this will be a new tradition!!! Beautiful home, excellent location Spacious beautiful home. Excellent location. Perfect in every way other than a few minor issues which were quickly resolved. Looking forward to another visit. amazing! We had a family vacation and chose Born to Sun. The house was amazing and fit our needs for the group that we had. Carrie and Katherine and everyone went above and beyond to make our stay a great one. I would recommend this house to anyone. Awesome Vacation! F.U.N. - Fantastic House! Unsurpassed Service! Nearby Activities and Shopping! Fantastic House! - Our annual family reunion beach vacations require a house that can accommodate between 30-40 people (adults and children). BeachReunion has several beautiful homes that will comfortably accommodate us, but The Venetian Palace has been one of our favorites! The beautifully decorated home includes a wonderful, open design for our large group activities, one of the grandest and most beautiful swimming pools in the area, a full outdoor kitchen, a convenient and spacious movie theater, and a kitchen with all of the conveniences of home--and then some (i.e., two refrigerators!)! All of this less than a 5 minute walk from a private beach--with chairs and an umbrella reserved for us each day! Unsurpassed Service! - The service is nothing short of outstanding! There was a concierge available to us every day (Carrie) while in The Venetian Palace. She was the friendliest, most accommodating and helpful concierge I have ever experienced. This year (June 2017), we celebrated a 70th birthday with a catered, "white attire" celebration at the house AND a wedding on the beach. Carrie was available even before our arrival to assist us with planning, logistics, and by providing a list of recommendations for local vendors, caterers, suppliers, etc. She also assisting us by receiving some of our supplies and materials (some even before our arrival) and delivering the boxes to us at the house. We would not have enjoyed the success of these two special events without her assistance (Thank you again, Carrie!). And while there were only a couple of minor issues that required attention, (wifi login, light bulb change), friendly maintenance personnel seemed to arrive within minutes of a phone call to the office. We felt like it was the mission of everyone, even the maintenance personnel, to ensure that we had a wonderful and carefree week! Nearby Activities, Restaurants and Shopping! - There is easy access to golf, deep-sea fishing, water parks, water sports, shopping, and food (especially seafood)! Once again, Carrie quickly and effortlessly provided information and assistance to connect us to everything we were interested in exploring. We will certainly return to this house and have already recommended it to others! Very clean, great views, awesome property with nice amenities. Perfect size of condo for our family of 5. Walking distance to beautiful beaches! Great cardio room, basketball and tennis courts! Amazing House! We rented this house for a 60th birthday party/family reunion and we all fell in love with the house and location. It is only a very short walk to the beach. The pool is so nice with a nice ledge for sitting or putting in your beach chair. The recently remodeled house is spacious and clean with plenty of room. We had 30 people and were never crowded with ages from 2 1/2 to 62. We especially loved 2 coffee pots for all that early morning coffee. Every thing you need is here! We will be back! Our Concierge takes great care of our guests! "We made it home safe & sound. It was a wonderful week in Destin. The house was awesome, Destin Health & Fitness worked out great, and the golf was good (although I wish I played better). Thank for all of your help with the planning and coordination. You do a great job and we all appreciate it. Take care!" REVIEW TAKEN FROM VRBO: "Property was exceptional and any issue we had was taken care of with sense of urgency. Brought us new grill when the one there wasnt functioning. Only minor criticism is that some of kitchen cooking tools are a little worn and sub-standard (at least for a place this nice). Also, would love to see TV in master bedroom placed in bedroom and not in the office area - it was very difficult to watch while relaxing in bed. Other than those minor things, everything was excellent!" Our group really enjoyed the Adonis house. The house was very spacious and had some nice amenities. The layout was great for a big group of people. The heated pool and hot tub were really nice, and the location was great for beach access, as well as getting to restaurants and other businesses. We hope we can come back in the future. THANK YOU!!!! The Mikonos is a great house for our annual family vacation. It easily accommodates the 20 of us ranging in ages from 5-72. Weve stayed in other houses in the Destin area, but never more than once. Once we stayed at the Mikonos and enjoyed its convenience to everything in the area, the attentive office staff and owner, we have made it our Destin destination home! Our family appreciates the way the Mikonos guests are always treated like family. We now have stayed at the Mikonos for 6 visits and look forward to continuing to make family. Memories in such a great house in the coming years. This truly is an Amazing house, my family of 30 stayed in June!! Nothing short of Spectacular!!! We will be back...the folks at Beach Reunion are so AMAZING to work with... ALL OF THEM, (you gotta keep your eye on Penny though as she is quite the prankster and Jim is seriously the BEST host ever!!!!) THANK YOU BEACH REUNION for a MOST MEMORABLE VACATION!!! We can not express our thanks and appreciation for upgrading us to your beautiful Mikonos home. Our family was originally scheduled to stay at the athena the week of 08/20/2012 but due to repairs we were upgraded to your spectactular home, we felt like we won the lottery. Your home is beautiful, clean and spacious we cant say enough. Thank you again for your generosity you truly made our family reunion one we will never forget. Respectfully, The Byrne, Lackner, Sanger & Flythe families. Had a wonderful time. Beautiful interior. Great beach. Close to grocery store and outlet malls.